Then I stopped by the seafood market and picked up a dozen littleneck clams, a pound of wild salmon and a lemon. I found this recipe for steamed mussels and clams. I didn’t have a lot of the ingredients (including the mussels), so I made a lot of substitutions. I had to make my own cocktail sauce, but didn’t have horseradish, so I added hot chinese mustard. The sauce ended up pretty ketchup-y, but was still good. I don’t usually have butter in the house, so olive oil stood in for that in the other sauce. The dish was really pretty and tasted pretty good too. The juxtaposition of the red and green sauces is perfect for this time of year. There is a new type of farmshare in town that is really neat. 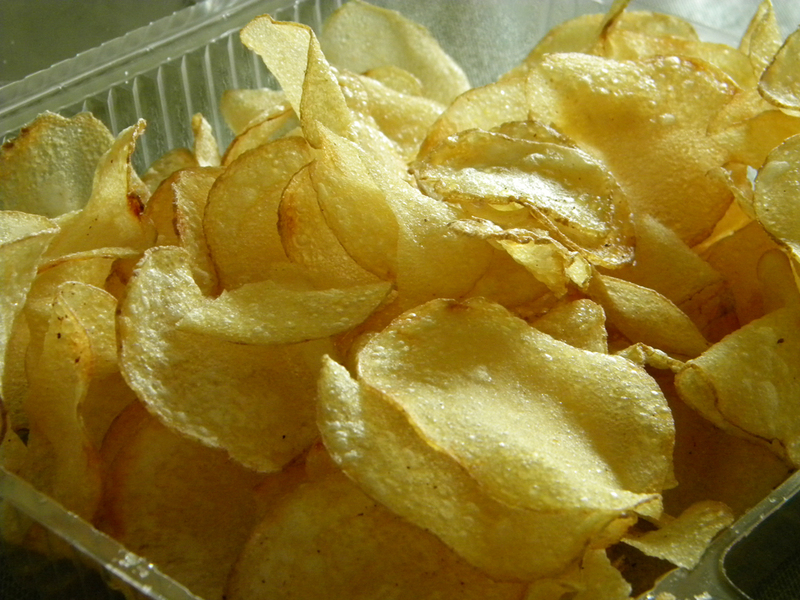 Eating Out of the Box has both medium and large boxes on offer and they gather produce from various farms in the area. I get mine delivered. The boxes become available in the middle of the week, which is nice because that’s about the time I run out of fresh stuff from the weekend market. 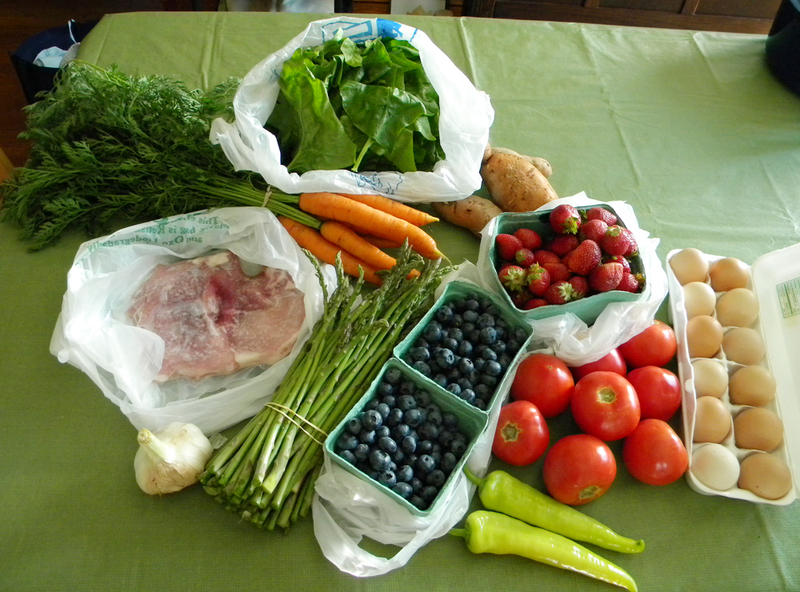 I’ve tried it twice and gotten some really good stuff including lemongrass, Asian pears and all kinds of greens. This week, joi choi arrived (a larger version of bok choi). The thing I love about farmshares is that you get ingredients you wouldn’t normally buy and so you learn to cook new dishes. I’m still trying to find something to do with the huge daikon radish that arrived this week. 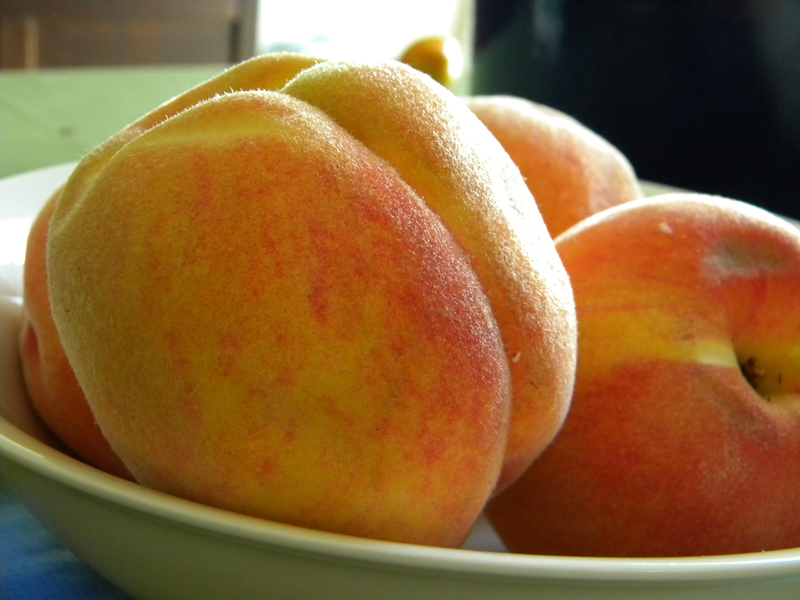 Posted in Cooking, Food, Fruit, Holiday, Local, Lunch, Recipes, Seafood, Sustainability and tagged clams, cooking, farm, farmshare, food, onions, salmon, sustainability. Bookmark the permalink. The market was hopping yesterday morning — people were picking up Halloween pumpkins, prepping for OysterFest and chatting about the incoming hurricane. Alas, the two vendors whose products I was craving were nowhere in sight — therefore, no maple sausage links from Black Bottom Farms and no smoked salmon salad from Neopol. Hopefully they’ll both be back next week. I toyed with picking up smoked salmon from the seafood market to try and make my own smoked salmon salad, but unfortunately, the brand that they carry contains nitrites. Neopol smokes their own fish and their products do not contain nitrites. I haven’t figured out how I’ll prepare the wild salmon. I’m dreaming up a lemon-garlic sauce for the scallops. 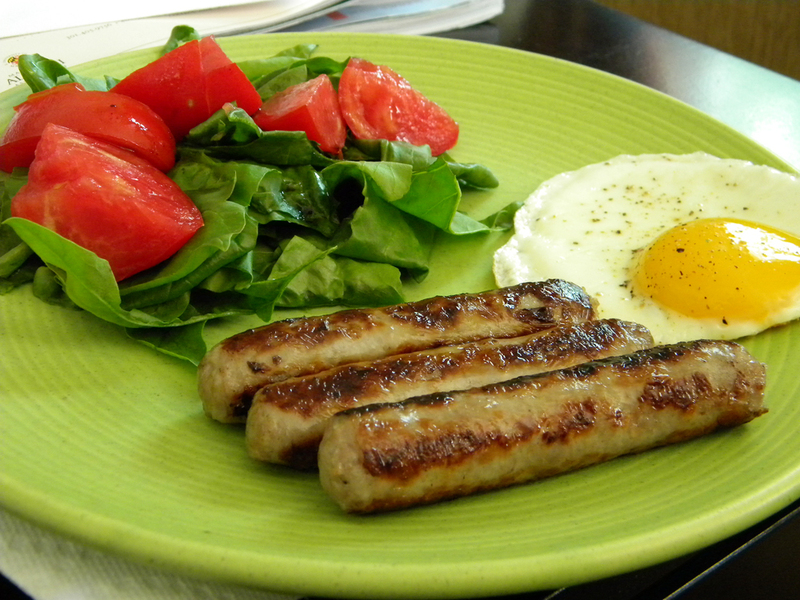 I bought the pork to make my own maple breakfast sausage. The chicken sausage will supplement when that runs out and I can also eat that for lunches/dinners. I’ve been eating a lot of burgers lately and that’s why I bought the bison. I like making my own patties better than the pre-formed patties. I took down the greenhouse cover off of the VegTrug — it was tied down with velcro strips, but I didn’t think they’d hold in strong winds. I hope the baby spinach plants survive. I have more hope for the kale, rosemary and chives. 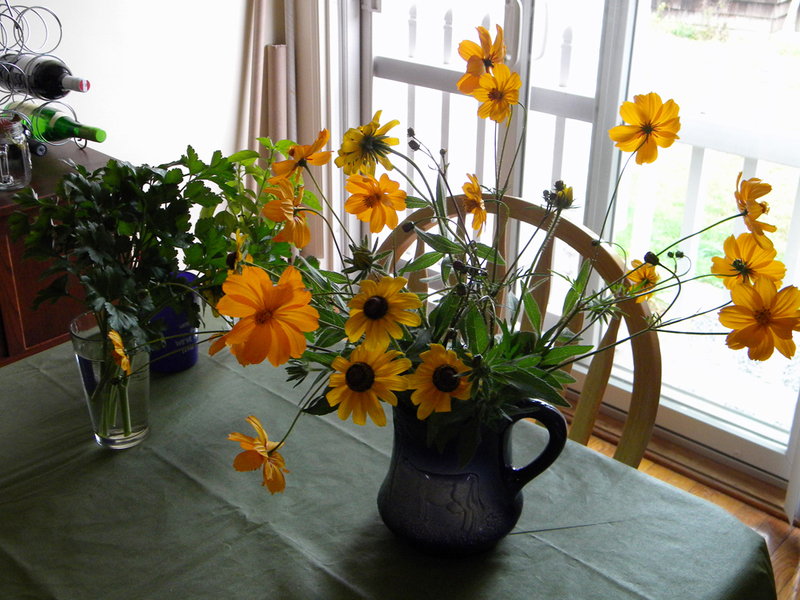 I went around picking flowers from my black-eyed susan and cosmo plants — they won’t survive the storm and I’d like to enjoy them awhile longer. Likewise, I took cuttings from my parsley and thyme plants, assuming they won’t weather the storm well (the parsley probably will; the thyme, not so much). Today, I ordered some garlic grow bags, bulbs and soil to plant after the storm is over. I’m looking forward to next year’s harvest! Posted in Breakfast, Cooking, Dinner, Food, Grow Your Own, Local, Meat, Seafood, Sustainability, Vegetable and tagged Amish, bison, carrots, cooking, food, gardening, mushrooms, onions, pumpkin, salmon, sausage, scallops, sustainability, sweet potatoes, tomatoes. Bookmark the permalink. Coldest morning of the fall so far here in Maryland. I stayed tucked in bed as long as I could. Then, I made bacon. Fortified by that, I headed out to the library and the market. I used to worry about getting to the market early so I didn’t miss out on the good stuff, but I like going later. The music today was really good again — Swampcandy. I’d seen him before at the Night Cat. His first song (at around 10 a.m.) was about drinking whiskey. Cheers to him. I quizzed Crystal at C&D Produce about what pumpkin would be best for soup. I had selected one that I thought would be fun to display on my porch before I cooked it — it had little orange “knuckles” all over it. She said that particular type would be hard to cut and wouldn’t have a lot of flesh. 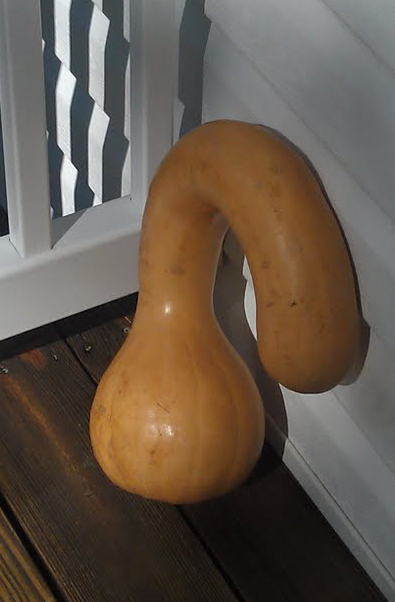 She suggested that I buy a neck pumpkin instead, explaining that they are the type that are used for canning pumpkin. She showed me how to cut it and bake it to get to the flesh. The bulb at the end is like a cantaloupe and the seeds are there. 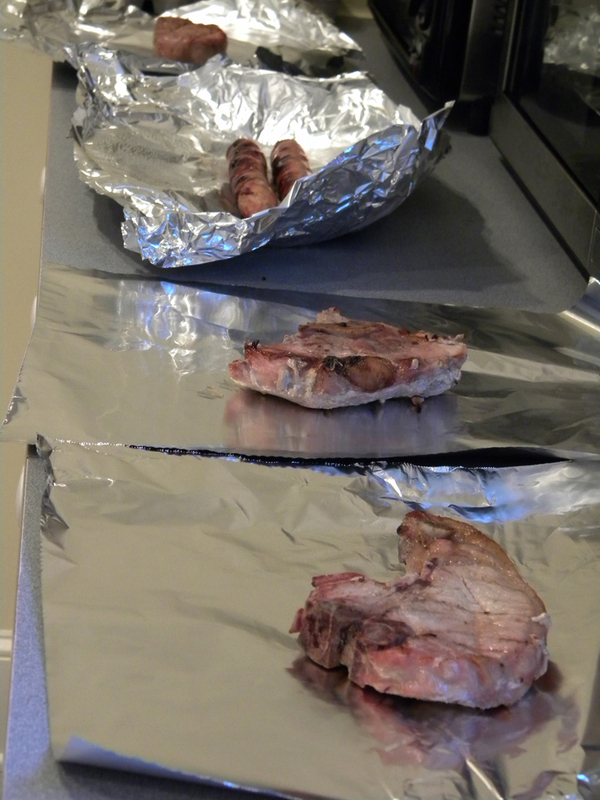 The neck can be chopped into sections and then halved and baked. I can’t wait to try it! It’s sitting on my porch in the meantime. Not sure how I’m going to prepare the bison filet yet, but that will be dinner and will most likely involve the mushrooms and some bacon. It got down to 34 degrees last night according to my phone. Not quite freezing, but close enough to start killing off my basil, even inside the little greenhouse covering on the VegTrug. 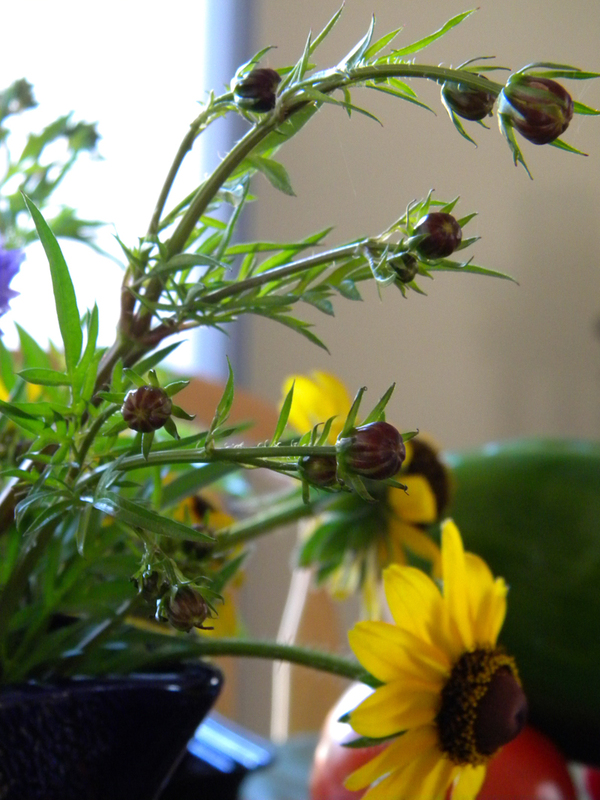 I snipped off the dead part and took a couple of clippings to try and root them in water. My kale is almost ready to harvest — about another week. These are the old plants, which regrew when I cut them back to the ground. The new ones haven’t really gotten past the seedling stage. The spinach I bought is growing slowly but surely. I still don’t have enough for a side salad though. I did a few fall clean-up items around the yard — disconnected the hose and spooled it, trimmed dead stalks off some of my hostas. 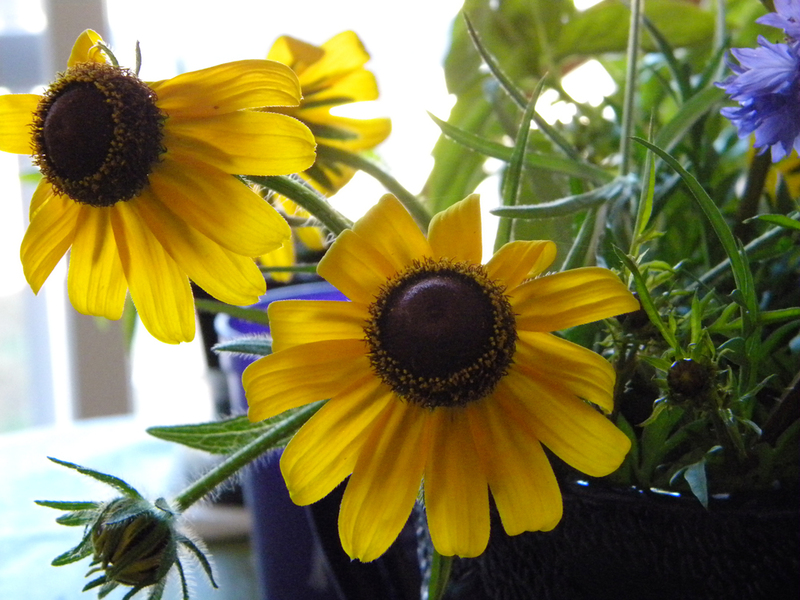 I figure my flowers outside (the summer ones) aren’t long for this world if the cold night temperatures continue. 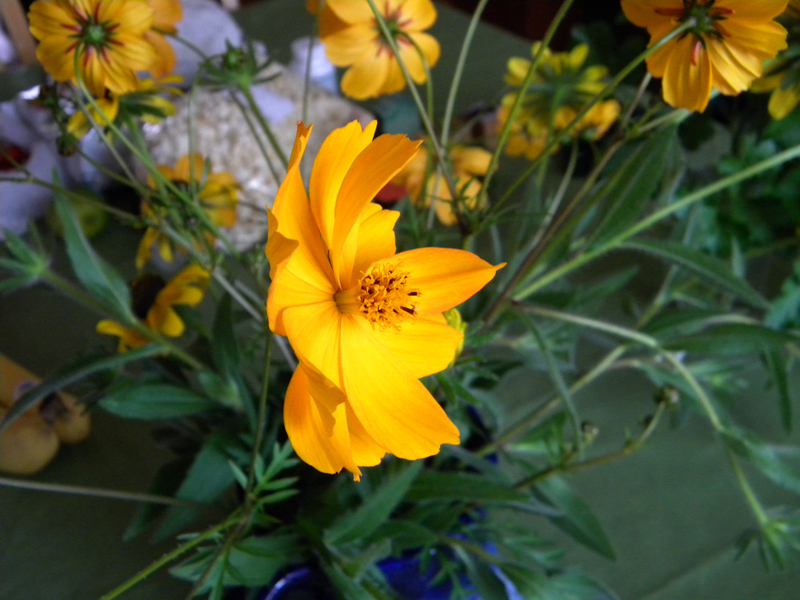 I cut a pitcher full of black-eyed susans, cosmos buds and some purple wildflower that I can’t identify. Might as well enjoy them while they last! I’m considering planting some garlic now for next summer. Haven’t gotten any further than considering it though. Posted in Breakfast, Cooking, Dinner, Food, Local, Meat, Seafood, Sustainability, Vegetable and tagged bison, broccoli, cooking, eggplant, food, kale, peppers, pumpkin, salmon, sustainability, tomatoes. Bookmark the permalink. I had wanted to pick up some pork for breakfast sausage, but the vendor I had in mind didn’t have any plain ground pork today. I decided to drive home and drop off my purchases so far before heading back out. I forgot to get the squash. Then I headed over to Captains Ketch and was surprised to see skate available there! 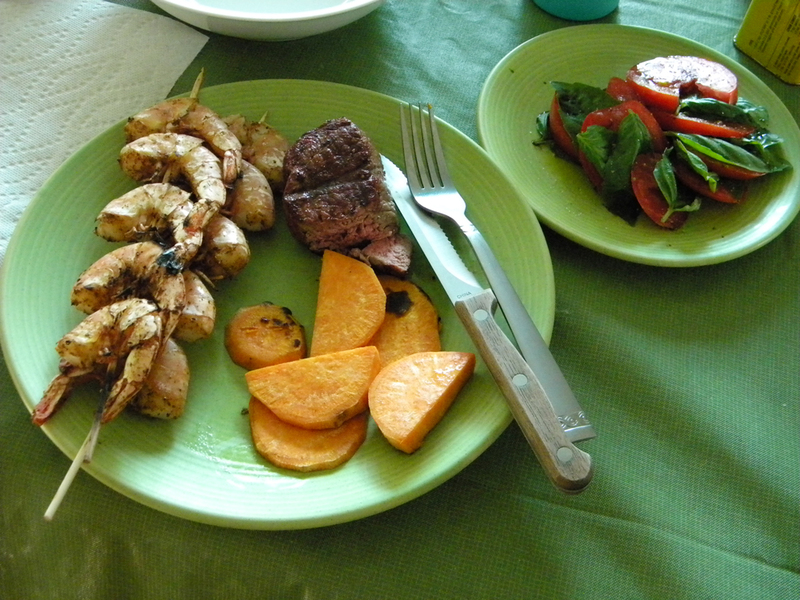 I picked up a 1/4-pound fillet, along with a lemon, scallops and mussels. Captain’s Ketch had recipes available for the skate. I chose one in which you broil it with butter, capers and lemon. I don’t usually have butter on hand, so I used olive oil. 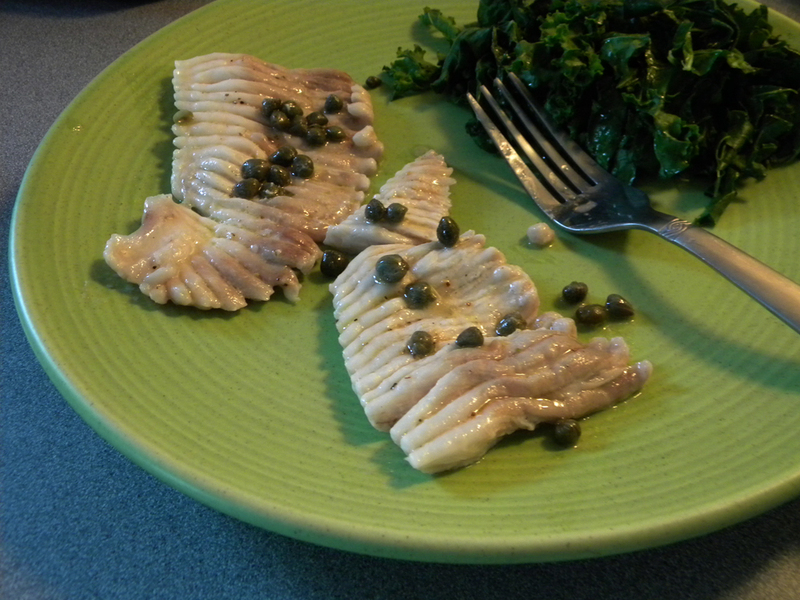 The meat of the fish is so mild, it really just ended up tasting like lemony capers. It’s the texture that’s so unique. I really wish I’d taken picture before I cooked it. Next time, I want to try sauteing it instead. Last week, I used some compost in my VegTrug for the first time. I can only hope that it’s making the existing plants grow faster. All I really noticed over the past week is the huge quantity of seedlings that cropped up from the compost itself (mostly squash and tomato plants). I spent several minutes pulling them up this morning. I think that if I had really worked the compost into the soil instead of just laying it on top of what’s there, this wouldn’t have been as much of a problem. Lesson learned for next year when I refresh the soil in the VegTrug. But it gave me an idea. I want to try and grow spaghetti squash next year and was going to try saving my own seeds from a purchased squash. I forgot to buy one today though — hopefully they’ll still be available next week. 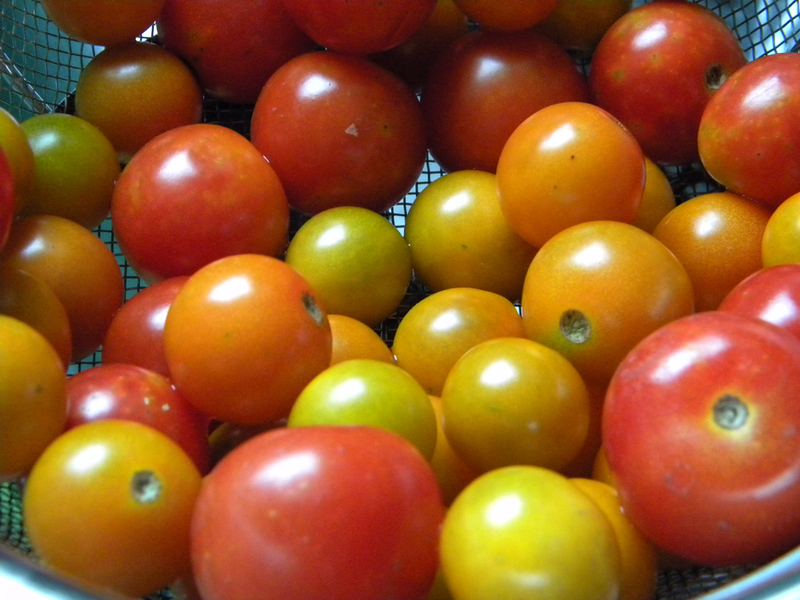 Posted in Cooking, Dairy, Dinner, Food, Grow Your Own, Local, Meat, Recipes, Seafood, Sustainability, Vegetable and tagged Amish, cheese, compost, food, gardening, kale, mussels, pork, salmon, scallops, skate, squash, sustainability, tomatoes. Bookmark the permalink. 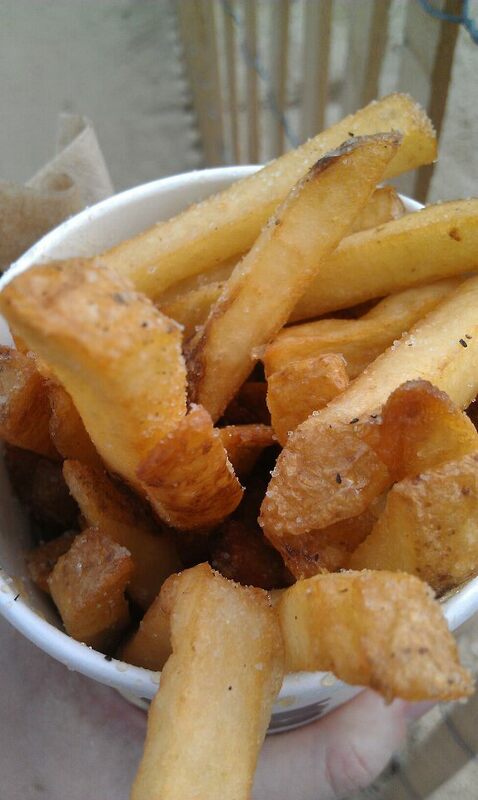 Boardwalk Fries (with malt vinegar, of course) at the beach! 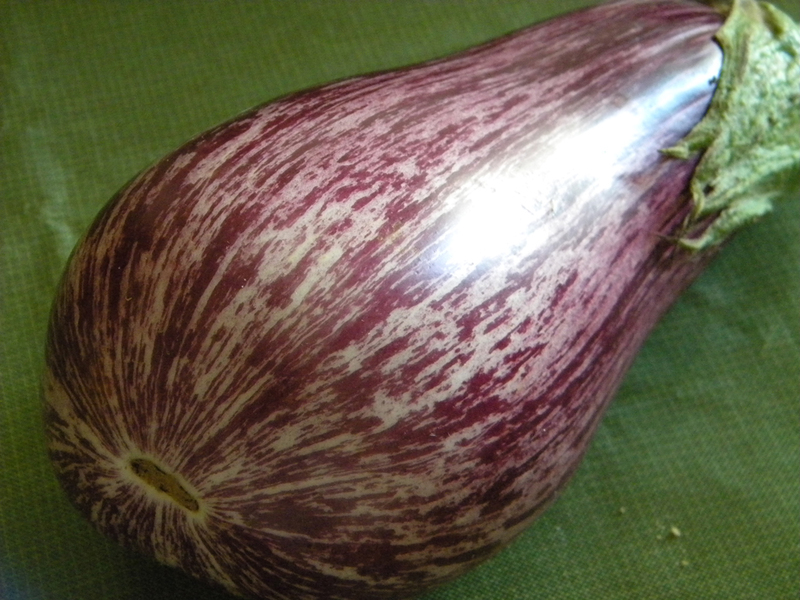 Isn’t this such a pretty eggplant? Then I headed to the Amish market and bought one pound of ground turkey (a mix of light and dark meat) for making my own breakfast sausage (see my next post on that) and some chicken breasts for grilling. I also stopped at the seafood market and bought shrimp salad (! ), flounder and salmon. The garden tomatoes awaiting me when I returned home. Here’s where it gets hot and buggy. I didn’t bother having my neighbors water my plants while I was gone. The stinkbugs have completely taken over. They don’t seem the least bit bothered by the lavender oil I sprayed on them and they mocked my marigold efforts by taking up residence in one of the pots and all but killing that plant. WTF? I guess I should have suspected that if either were really a tried-and-true solution, stinkbugs wouldn’t be the scourge that they are. I resorted to buying a stinkbug trap, despite the bad ratings I found about them. I need to try something, otherwise, I’m afraid the stupid things will set sights on my house when the weather turns colder. Blargh. So far, the trap has only caught one bug (and not a stinkbug). Double blargh. 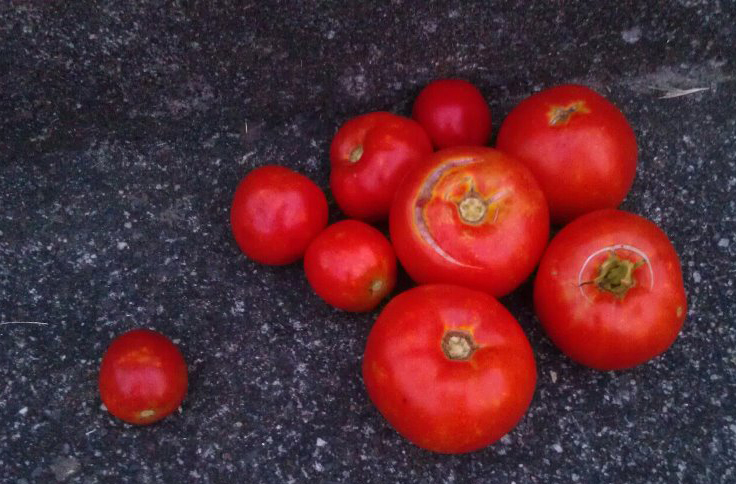 Despite not really getting watered (I think Easton had some rain while I was away though), my tomato plants produced quite a few ripe, red fruits (and a couple mushy/half-eaten ones too — thanks, stinkbugs). These may be among the last as the plants are yellowing and brown now and there are no new flowers budding. The pumpkin plant continues to grow while the stinkbugs eat and lay their eggs on it. I suspect that I should have developing fruit by now though and none have appeared yet (and I’m sure they’d be devoured anyhow). Sigh. The remaining squash plant is all but dead. Ah well. I have better plans for those plants next year. Now I can clear it and the spindly pepper plant out to seed some broccoli, kale, carrots and arugula for the fall. The stinkbugs appear to be leaving the remaining kale plants alone. I experimented while on vacation and the results are muddled. Wheat and/or gluten appear to be another issue for me. I can drink most beer without a problem, but had issues after drinking a wheat beer one night. I tried funnel fries on the boardwalk one day and also had issues with that. I’m going to look into what wheat-free baked goods are available to me at the “crunchy grocery” later this week and see if there’s a way to test things out further. I’m also going to give the wheat beer another chance (it happens to be my favorite type of beer). Triple blargh. Posted in Beverage, Cooking, Dairy, Diet, Food, Fruit, Grow Your Own, Local, Meat, Seafood, Sustainability, Vegetable and tagged Amish, beer, blackberries, broccoli, carrots, cheese, cooking, food, gardening, kale, peppers, salmon, shrimp, squash, sustainability, tomatoes, yogurt. Bookmark the permalink.